We were recently asked if the SF3700, LSI's latest flash controller, supports SATA Express and fired away with a bunch of other questions about the standard. The depth of this customer's curiosity suggested a broader need for education on the basics of the standard. To help me with the following overview of SATA Express, I recruited Sumit Puri, Sr. Director of Strategic Marketing for the Flash Components Division at LSI (SandForce). Sumit is a longtime contributor to many storage standards bodies and has been working with SATA- IO – the group responsible for SATA Express – for many years. He has first-hand knowledge of SATA- IO’s work. Here are his insights into some of the fundamentals of SATA Express. Sumit: There’s quite a bit of confusion in the industry about what SATA Express defines. In simple terms, SATA Express is a specification for a new connector type that enables the routing of both PCIe® and SATA signals. SATA Express is not a command or signaling protocol. It should really be thought of as a connector that mates with legacy SATA cables and new PCIe cables. Why was SATA Express created? Sumit: SATA Express was developed to help smooth the transition from the legacy SATA interface to the new PCIe interface. SATA Express gives system vendors a common connector that supports both traditional SATA and PCIe signaling and helps OEMs streamline connector inventory and reduce related costs. What is the protocol used in SATA Express? Sumit: One of the misconceptions about SATA Express is that it’s a protocol specification. Rather, as I mentioned, it’s a mechanical specification for a connector and the matching cabling. Protocols that support SATA Express include SATA, AHCI and NVME. What are the form factors for SATA Express? Sumit: SATA Express defines connectors for both a 2.5” drive and the host system. SATA Express connects the drive and system using SATA cables or the newly defined PCIe cables. What connector configuration is used for SATA Express? Sumit: Because SATA Express supports both SATA and PCIe signaling as well as the legacy SATA connectors, there are multiple configuration options available to motherboard and device manufacturers. The image below shows plug (a) which is built for attaching to a PCIe device. Socket (b) would be part of a cable assembly for receiving plug (a) or a standard SATA plug, and Socket (c) would mount to a backplane or motherboard fir receiving plug (a) or a standard SATA plug. The last two connectors are a mating pair designed to enable cabling (e) to connect to motherboards (d). When will hosts begin supporting SATA Express? 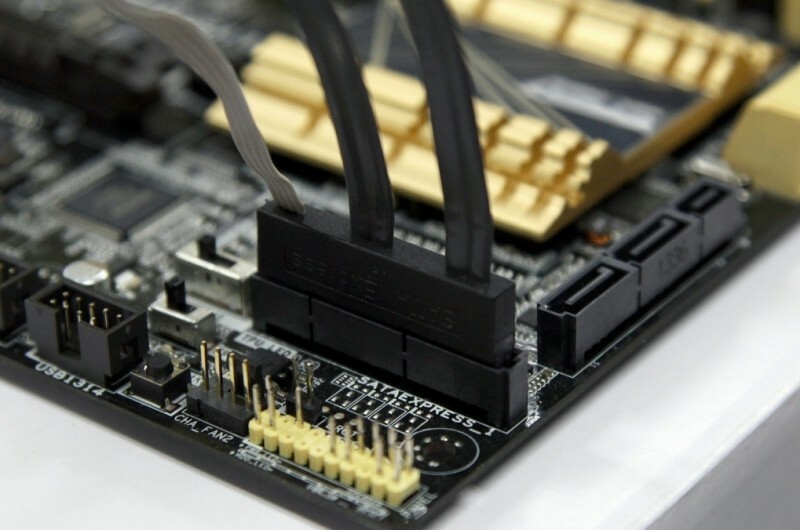 Sumit: We expect systems to begin using SATA Express connectors early this year. They will primarily be deployed in desktop environments, which require cabling. In contrast, we expect limited use of SATA Express in notebook and other portable systems that are moving to cableless card-edge connector designs like the recently minted M.2 form factor. We also expect to see scant use of SATA Express in enterprise backplanes. Enterprise customers will likely transition to other connectors that support higher speed PCIe signaling like the SFF-8639, a new connector that was originally included in the SATA Express specification but has since been removed. Will LSI support SATA Express? Sumit: Absolutely. Our SF3700 flash controller will be fully compatible with the newly defined SATA Express connector and support either SATA or PCIe. Our current SF-2000 SATA flash controllers support SATA cabling used on SATA Express, but not PCIe. Will LSI also support SRIS? Sumit: PCIe devices enabled with SRIS (Separate Refclk Independent SSC) can self-clock so need no reference clock from the host, allowing system builders to use lower cost PCIe cables. SRIS is an important cost-saving feature for cabling that supports PCIe signaling. It doesn’t support card-edge connector designs. Today the SF3700 supports PCIe connectivity, and LSI will support SRIS in future releases of SF3700 and other products. Why is it called SATA Express? Sumit: SATA Express blends the names of the two connectors and captures the hybridization of the physical interconnects. The name reflects the ability of legacy SATA connectors to support higher PCIe data rates to simplify the transition to PCIe devices. SATA Express can pull double duty, supporting both PCIe and SATA signaling in the same motherboard socket. The same SATA Express socket accepts both traditional SATA and new PCIe cables and links to either a legacy SATA or SATA Express device connector. How fast can SATA Express run? Sumit: The PCIe interface defines the top SATA Express speed. A PCIe Gen2 x2 device supports up to 900 MB/s of throughput, a PCIe Gen3 x2 device up to 1800 MB/s of throughput – both significantly higher than 550 Mb/s speed ceiling of today’s SATA devices. Is SATA Express similar to M.2? Sumit: There are two key similarities. Both support SATA and PCIe on the same host connector, and both are designed to help transition from SATA to PCIe over time. SATA Express was born of the stuff of all great inventions. Necessity. The challenge SATA-IO faced in doubling SATA 6 Gb/s speeds was herculean. The undertaking would have been too time-consuming to support the next-generation connection speeds that PCIe answers. It would have been too involved, requiring an overhaul of the SATA standard. Even in the brightest scenario, the effort would have produced a power guzzler at a time when greater power efficiency is a must for system builders. SATA-IO found a better path, an elegant bridge to PCIe speeds in the form of SATA Express.